Custom Sets | Aero Mock-Ups Inc.
We take great pleasure in working with a production and their creative vision to turn out memorable scenes. By supplying our core aircraft sets and equipment we have greatly reduced the cost of building out an entirely new set for them. Here are some of the projects on which we have collaborated. The premise behind this shot was to show an aircraft being built while it was flying. 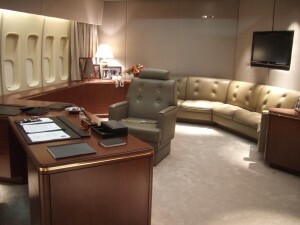 The flying “Oval Office” and Air Force One conference room is created from our wall panels, seats and sofas. What were straight walls are curved to make the forward “747” nose cabin section. A wonderful example of where the imagination can go. A jumbo wide executive set dressed by production. Three (3) aisle cabin trainer set up to train six (6) flight attendants at one time. Participants: Line Flight attendants, FAA and Teal Team trainers. P/ns: 20 NB and 14-7 A 25’ long cabin trainer with practical emergency over wing exits. This set was commissioned by the FAA/CAMI to run passenger evaluation tests. Set up in a banquet reception area during the assembly of the International Airline Cabin Safety Symposium.